Library Track / Relink... works with Multiple .MAX .MAT or XRef files without opening them. Dedicated to organize, collect or relink whole model library or all projects after moving them to new location. Just few clicks and they ready to merge / open ! - Show assets status ( OK -network, OK - local, Not found ) Status is based on real check if file exist in network or HDD, not from asset manager. - Show and change asset paths in multiple max files without opening them. - Track, Auto-Relink, Collect all Assets inside of Xref files. - added small help info in Auto-Relink dialog - button "?" - Save settings - List colors, window location and size etc. - fixed double click on image file. - added: Show amout of Assets and Missing Assets in Main MaxFiles window - requested by 3dwannab - thanks ! - Right-click menu for more operations. None of functions works in demo version. All purchases from pixamoon.com are send automatically in few minutes now ! All updates till v2.00 will be send automaticaly too. To activativate your license and get new updates please register your purchese and e-mail first. Let me know what you think. Waiting for all sugestions. Submitted by 3dinfographics on Wed, 2019-03-20 01:54. And amazing support also by email. Submitted by gio_cgi on Tue, 2019-02-26 02:44. Submitted by 123joris456 on Wed, 2019-02-06 08:31. And super speedy support also by email, cheerio! Submitted by Waltez on Sat, 2019-02-02 08:51. It allows the "resalve" file libraries max updating them to the latest version with the possibility to apply customized scripts. Submitted by uff on Thu, 2018-12-06 04:06. Submitted by pixamoon on Wed, 2018-12-05 07:54. This problem is already fixed in new test versions. Will publish new update in few days. Submitted by MSIcloud on Sun, 2018-12-02 12:10. Really great plugin - lifesaver. Works perfectly. Submitted by Jamie Murphy on Mon, 2018-11-26 16:10. 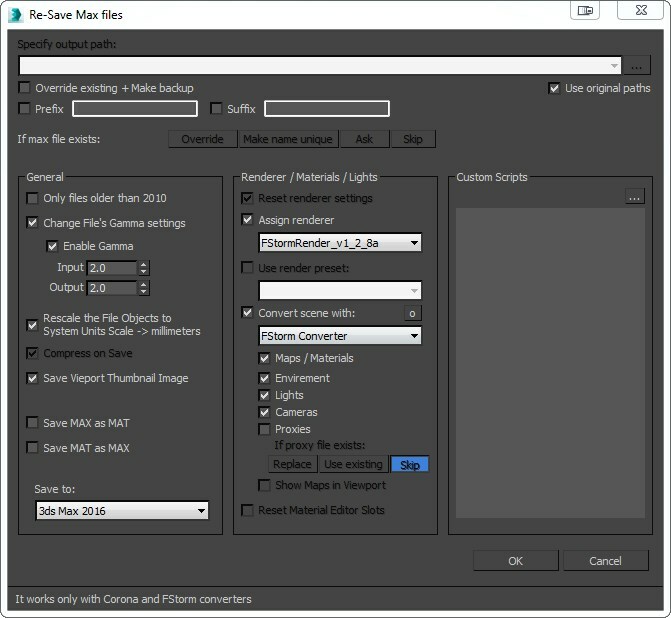 Fstorm scene converter not working for me. Fstorm Scene Converter not working, when I press the little 'o' to display the path it isn't showing a .MS file for Fstorm, only Corona related .MSs. Any suggestions? Where can I have the .MS file that's required? Thank you. Submitted by Primastudio on Tue, 2018-11-20 07:10. It solved so many problems with the management of assets through multiple network drives. Submitted by pixamoon on Sun, 2018-07-08 07:44. It should recognize all assets. Can you explain bit more about it ? 1. Which hdri slot do you mean ? 2. Vray, Corona or other render engine ? 3. which versions or max and renderer ?